« There is more to chili than “meats” the eye! (Meredith’s bon mot)! It’s Oscar time of the year, so categories are on my mind. 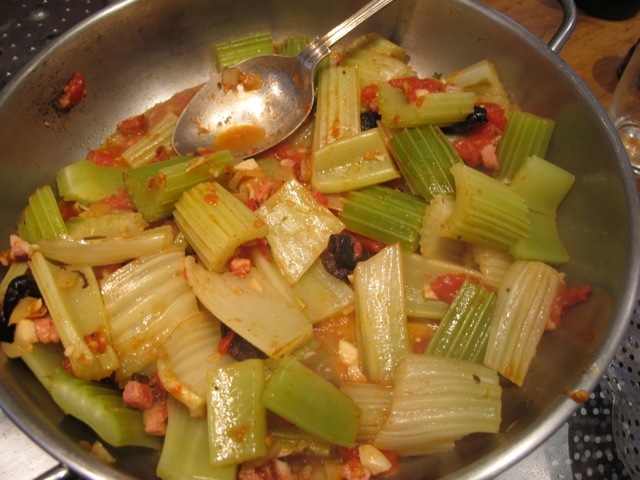 Celery often features chez nous; sometimes in bit parts–literally–as one element of a soffrito or in a supporting role as a dipping stick for sauces like anchoiade, hummus or guacamole. Here, it comes out of the shadows and into the spotlight to take the lead, the eponymous role even–with a strong supporting cast. Steam the celery until it’s tender and set aside. 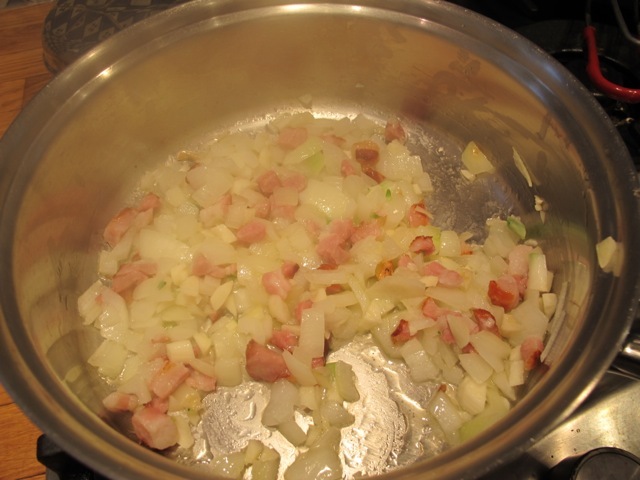 Sauté the bacon, onion and garlic in the oil until they start to color. 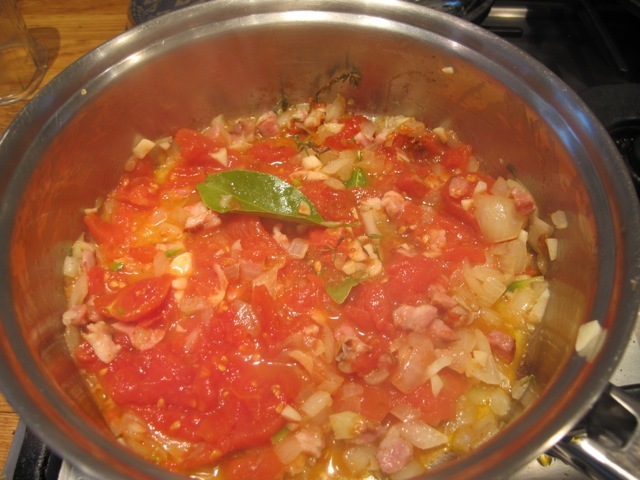 Add the chopped tomatoes with the spices, herbs and a pinch of salt. Cook these gently for five minutes. Add the wine and cook another couple of minutes to let the wine evaporate. Add the olives and cook on for a couple of minutes. Turn off the heat and add the celery, turning it over thoroughly in the sauce. Spread a layer of the celery mix over the base of an oven proof gratin dish. Season and sprinkle over some parmesan. Repeat the process–seasoning and sprinkling cheese over each layer. Place the dish on the highest shelf–checking after 20 minutes. The gratin should come out sizzling with a pleasingly charred look. 3 large tinned tomatoes–chopped.. does that mean 3 tins or just 3 tomatoes out of 1 tin? 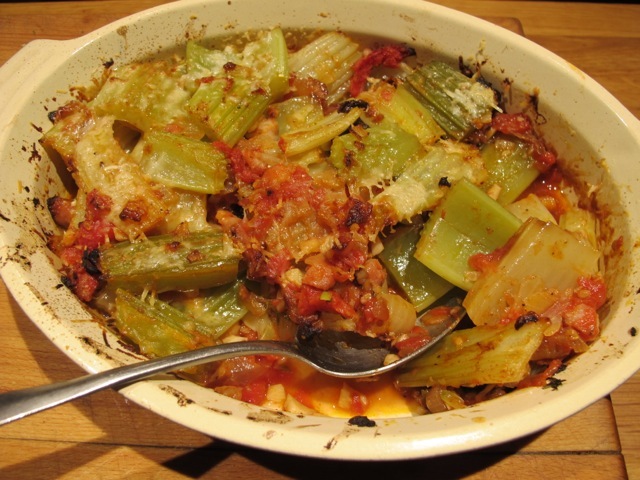 This looks good and I’m always trying to find a recipe for celery that is warm… Thank you!! I HAVE to try this! Three large tins of tomatoes would dominate the award ceremony! Just 3 large toms, Jude. I thought so… but just thought I would check… Thank you!! This is going on the table tomorrow! This would be a fabulous snack for those who need more daily fiber, as long as the strings in the celery remain. Also, a wonderful diuretic for those who have blood pressure issues, love it!!!!!! I am a new subscriber to your lovely blog. Such a delight to be able to connect with you across the miles in this way and receive your wonderful recipes! I am a retired teacher(38 years in the saddle!). My husband ( who is also a wonderful cook and spoils me with delicious dinners every night) and I live in Laguna Niguel, CA. I am a huge Poldark fan and recently bought the DVD and am enjoying the series as much as I originally did. I also loved She Loves Me! Do you like jazz? My son, Randy Ingram, is one of the hot young jazz pianists in NYC. I’d love to send you one of his cds. How can I do this? You can read about him on RandyIngram.com. Sending greetings to you from the California Riviera to France! My husband used to sing this funny little song about celery, ” we are from civril and don’t eat celery”, not sure why, but offering him celery he would give be the eye for sure and ask” hum mrs. b, I am from civril, what are you thinking?” 😉 Having said all that, I think I have to give this a try and risk the song. Robin my mouth is watering,this will be on the menu in the week.Love celery either to crunch fresh or cooked, looking forward to it. Looks like a winner! Kudos to you for coming up with a substantial role for celery! So thrilled to hear from you! I forgot to mention that we have some dietary challenges as my husband is allergic to dairy and eggs. It has made us eat more simply- lots of vegetables and fish and chicken. We are also constantly checking food labels. To satisfy our sweet tooth we have found chocolate “ice cream” made with coconut milk. Your recipes will be helpful! Take care! This looks so-o delicious – I shall have to devise a ‘sans gratin’ version though, as I unfortunately can not eat any sort of cheese… Many thanks for all your inspiring recipes, I’m so glad I found this blog – it’s brilliant, and is helping me to keep to a New Year Resolution to “broaden my diet”! Try a couple of tablespoons of breadcrumbs mixed a little olive oil and seasoned sprinkled over the top. That would give a bit of a crunch. Well, I ended up making a ‘stove-top’ vegan-version of this, using most of your tasty ingredients! I have to be careful about additives, and there was no organic additive-free bacon available (though apparently the nitrite-free stuff is cured with sugar anyway…), so I ended up substituting a tin of organic green lentils for the bacon and the cheese – Delicious, just scoffed two portions of it with brown basmati rice, and green salad – may try it with buckwheat pasta another time. (Thanks for the breadcrumbs idea – it would be fine for many, but unfortunately I have wheat and rye intolerance too..!). Now, shall I go and eat a little more…? !